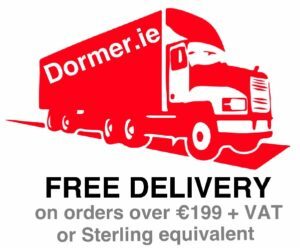 Dormer.ie is owned by Dormer (Ireland) Limited, a company registered in Ireland. We at Dormer (Ireland) Limited respect your right to privacy and comply with our obligations under the Data Protection Acts 1988 and 2003. The purpose of this website cookies and privacy policies is to outline how we deal with any personal data you provide us with whilst visiting this website. Naturally, if you are not happy with our cookies and privacy policies you should not use this website. By visiting this website, you are accepting the terms of this website cookies and privacy policies. Any external links to other websites are clearly identifiable as such, and we are not responsible for the content or cookies and privacy policies of these other websites. This is data that identifies you or can be used to identify or contact you and may include your name, email address, address, telephone number and user IP addresses in circumstances where they have not been deleted. Such information is only collected from you if you voluntarily submit it to us. We use the non-personal data gathered from visitors to our website in an aggregate form to get a better understanding of where our visitors come from and help us better design and organise our website. We may provide non-personal data to third parties, where such information is combined with similar information of other users of our website. For example, we might inform third parties regarding the number of unique users who visit our website, the demographic breakdown of our community of users of our website, or the activities that visitors to our website engage in while on our website. The third parties to whom we may provide this information may include our manufacturer’s, commercial partners and similar parties. We will not disclose your personal data to third parties unless you have consented to the disclosure or unless the third party is required to fulfil your order. We will disclose your personal data if we believe in good faith that we are required to disclose it in order to comply with any applicable law, a summons, a search warrant, a court or regulatory order, or other statutory requirement. Your personal data is held on secure servers hosted by our internet service provider, Blacknight. The nature of the internet is such that we cannot guarantee or warrant the security of any information that you transmit to us via the internet. No data transmission over the internet can be guaranteed to be 100% secure. However, we will take all reasonable steps (including appropriate technical and organisational measures) to protect your personal data. You may inform us of any changes in your personal data, and in accordance with our obligations under the Data Protection Acts 1988 and 2003 we will update or delete your personal data accordingly. To find out what personal data we hold on you or to have your personal data updated, amended or removed from our database please contact us at info@dormer.ie Any such data subject requests may be subject to the prescribed fee. Any changes to this website cookies and privacy policies will be posted on this website so you are always aware of what information we collect, how we use it, and under what circumstance, if any, we disclose it. If at any time we decide to use personal data in a manner significantly different from that stated in this website’s cookies and privacy policies, or otherwise disclosed to you at the time it was collected, we will notify you by email, and you will have a choice as to whether or not we use your information in this manner.